What Day Of The Week Was November 8, 1965? 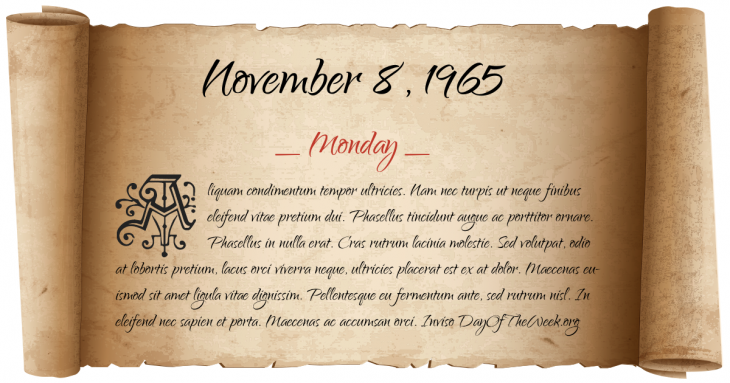 November 8, 1965 was the 312nd day of the year 1965 in the Gregorian calendar. There were 53 days remaining until the end of the year. The day of the week was Monday. A person born on this day will be 53 years old today. If that same person saved a Half dollar every day starting at age 6, then by now that person has accumulated $8,665.50 today. The 173rd Airborne is ambushed by over 1,200 Viet Cong in Operation Hump during the Vietnam War, while the 1st Battalion, Royal Australian Regiment fight one of the first set-piece engagements of the war between Australian forces and the Vietcong at the Battle of Gang Toi. The British Indian Ocean Territory is created, consisting of Chagos Archipelago, Aldabra, Farquhar and Des Roches islands. Who were born on November 8, 1965?